He claims to be more mature now, chastened by a stint in jail and eager to be just as much a businessman as a fighter. 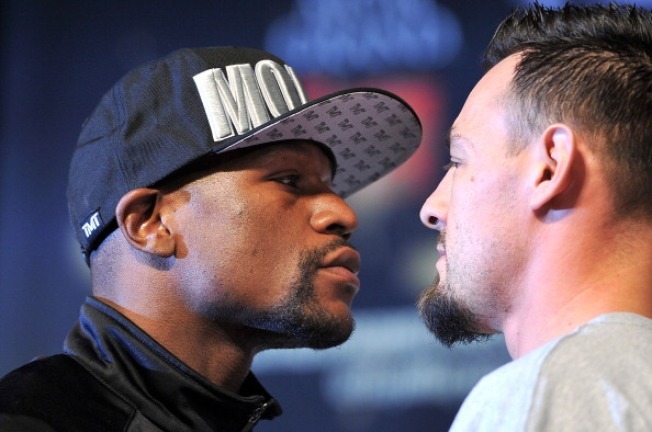 Indeed, Floyd Mayweather Jr. acted almost statesmanlike earlier this week when Robert Guerrero's father began screaming that he was a woman beater who would finally get beaten himself Saturday night. 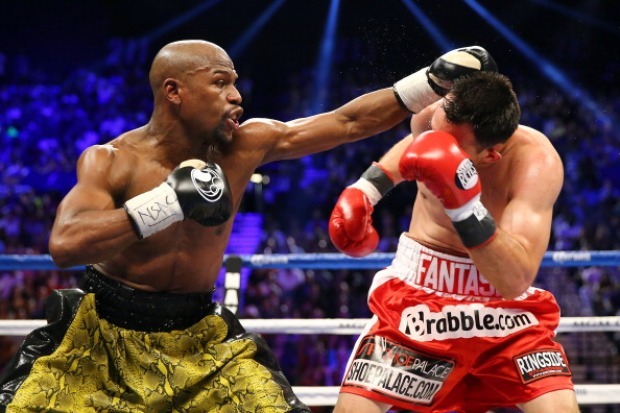 ''The fighters are the ones who fight, not the fathers,'' Mayweather said calmly. If it's an act, it's a pretty good one. Armed with a new six-fight television deal with Showtime that should keep him the world's highest paid athlete, Mayweather has for the most part taken the high road while promoting his fight against Robert Guerrero as must-see TV for anyone who has an extra $69.95 for the pay-per-view. 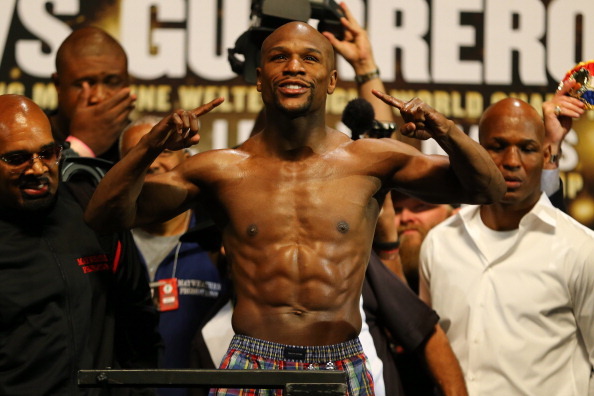 Mayweather weighed in at 146 pounds on Friday. Guerrero checked in at the weight-class limit of 147. The two meet in a scheduled 12-round welterweight title match at the MGM Grand hotel in what will be Mayweather's first fight in a year. It's also his first ring appearance since serving a jail term for assaulting the mother of his children, an experience he said helped him grow up. Sometimes, though, he just can't help himself. The old Mayweather surfaces, complete with the bad-boy persona that has made him the biggest draw in boxing. It could be that Mayweather as the promoter is trying to give a fight that still hasn't sold out some much needed buzz. More likely, though, is that he's looking for a bit of a mental edge for a bout that, despite the odds, could be very competitive. He called Guerrero a hypocrite for promoting himself as a devout Christian, and then getting arrested on gun charges in New York. He mocked him for bringing up his jail sentence when he may be facing one himself. 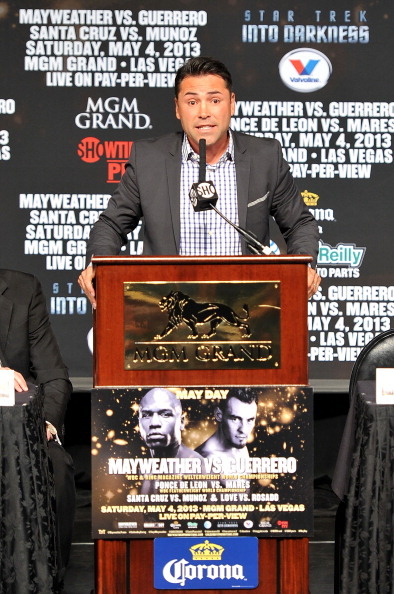 Guerrero has had his share of things to say about Mayweather, too, though it was his father who made the loudest statement when he repeatedly called Mayweather a woman beater at the final prefight press conference. The game plan in the Guerrero camp is the same as it will be in the ring - not to back off when challenged. 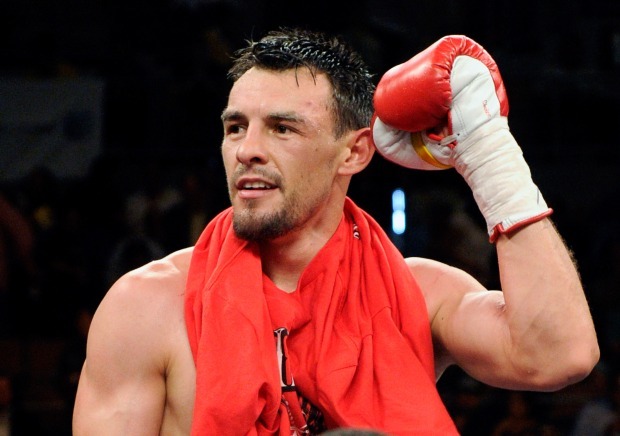 ''That's part of his game, getting under your skin and getting you off your game,'' Robert Guerrero said. ''It's not working. He's in for a fight and he knows it.'' None of the talk matters, of course, once the two men finally meet. The title belt at stake doesn't matter all that much, either, in an era of inflated and cheap titles. Mayweather has a franchise to protect, one that has made him untold millions of dollars since he beat Oscar De La Hoya in 2007 to catapult into the top seller ranks. He'll earn $32 million to take on Guerrero and try to remain perfect in 44 professional fights. No one questions Mayweather's ability after crafting both a career and an empire with his fists. But he got hit with more punches than usual in his last fight, against Miguel Cotto - a bout he won even while admittedly not at his best. He's also an aging fighter at 36, hasn't fought in a year and spent two months since then doing pushups - in solitary confinement in a small cell in downtown Las Vegas. Mayweather claims he's going to fight more regularly - including a bout in September - but he hasn't fought twice in a calendar year since 2007 and must deal with the real possibility of ring rust against Guerrero. Adjusting and adapting may be the key in the fight, which pits Mayweather against a rugged challenger who fights as a southpaw. Guerrero seems intent on putting pressure on Mayweather and making him fight every minute of every round - something that other opponents have for the most part failed to do. Oddsmakers have Mayweather a 6-1 favorite against a fighter who moved up to welterweight just two fights ago and got the fight mainly on his impressive win in his last outing against Andre Berto. Guerrero - who won two world titles at 126 pounds and another at 130 - will get $3 million for the fight, but understands the rewards for being the first one to beat Mayweather would be a lot more. ''A lot of people underestimate how strong I am in the ring. People underestimate my strength and it really is a big downfall for them,'' Guerrero said. ''You have a strong body, you have fast hands, you have heavy hands and you have the skill and talent to put things together and be able to change up things in the ring. It really is a game changer for a fighter.'' Both fighters will have their fathers in the corner, with Mayweather bringing back his after a long absence. Floyd Mayweather Sr. is replacing Roger Mayweather, who has been in his nephew's corner for 13 years. Mayweather said his uncle's diabetes makes it hard for him to see now, and he needs someone in the corner who can help him make adjustments. Ruben Guerrero trains his son, and injected some spark into the prefight buildup with his tirade at the press conference. Ruben Guerrero and Floyd Mayweather Sr. then began jawing at each other before being separated. On Saturday night, they'll be confined to their corners. Their sons will be the ones doing the fighting.